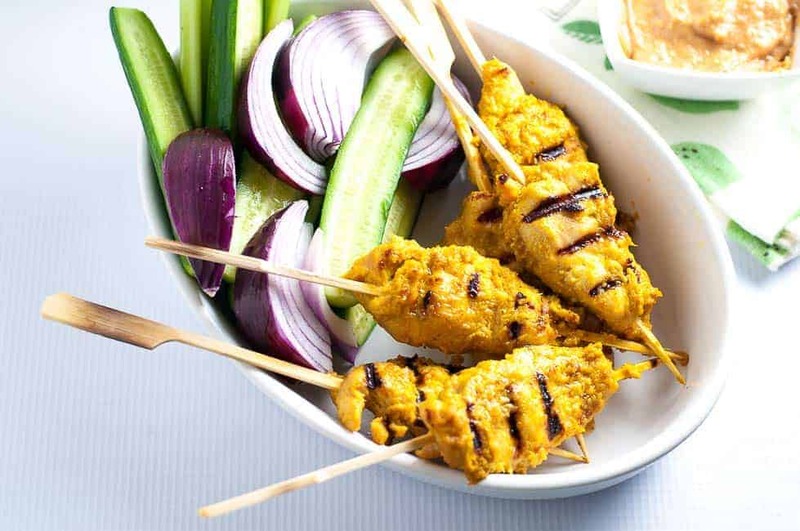 This Simple Singapore Chicken Satay with Peanut Dipping Sauce is crisp and spicy and it’s a perfect choice for a barbecue, a party or a simple weeknight meal. Satay! Even the word conjures up visions of hot nights, sizzling grills and flavourful meat. This Chicken Satay makes a great appetizer or a light meal when served with some crunchy veggies. It’s crisp and spicy and it’s a perfect choice for a barbecue, a party or a simple weeknight meal. It’s an easy meal that you can cook on either an indoor or outdoor grill. Singapore Chicken Satay is a must-try. While researching possible places to eat in Singapore, we came across Lau Pa Sat. 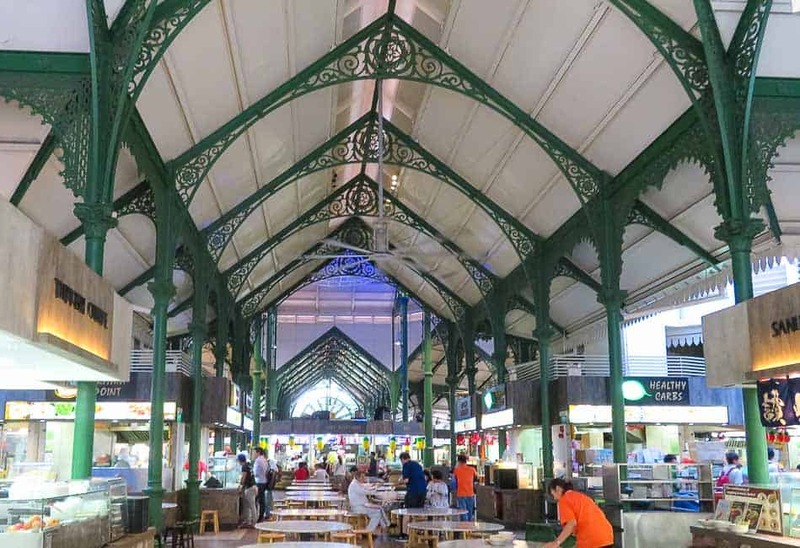 It’s a hawker centre, right in the middle of the Central Business District, selling a wide variety of Asian specialties, from Tom Ka Gai Soup, Fish Head Soup, Vietnamese Spring Rolls to Yakitori, all at reasonable prices. As soon as it gets dark, however, Lau Pa Sat satay street wakes up and the area comes alive. It’s transformed into an outdoor dining area where stalls are swiftly set up on the pedestrian-only street to serve the crowds of office workers who stop in for satay and a cold beer before heading home. Skewers of chicken, beef, pork and lamb sizzle on grills, filling the air with tantalizing aromas. We ordered satay with spicy peanut sauce and pineapple salsa with a side of chirpy chips smothered in curried mayo. 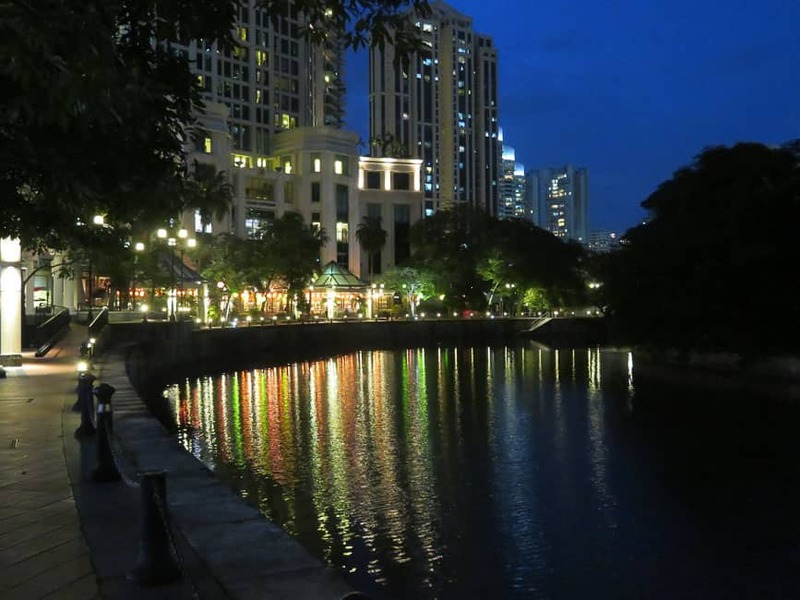 Being able to enjoy our meal outdoors and then stroll along the river to our hotel on a warm sultry evening when we knew it was snowing at home made one of those “travel moments” that we won’t soon forget. I’ve done my best to recreate that meal, and this simple Singapore Chicken Satay with Peanut Sauce recipe is the result. I’ve included the same recipe for Peanut Sauce that I used in this Crunchy Thai Noodle Salad. Mix and marinate, skewer the chicken, grill and dip! 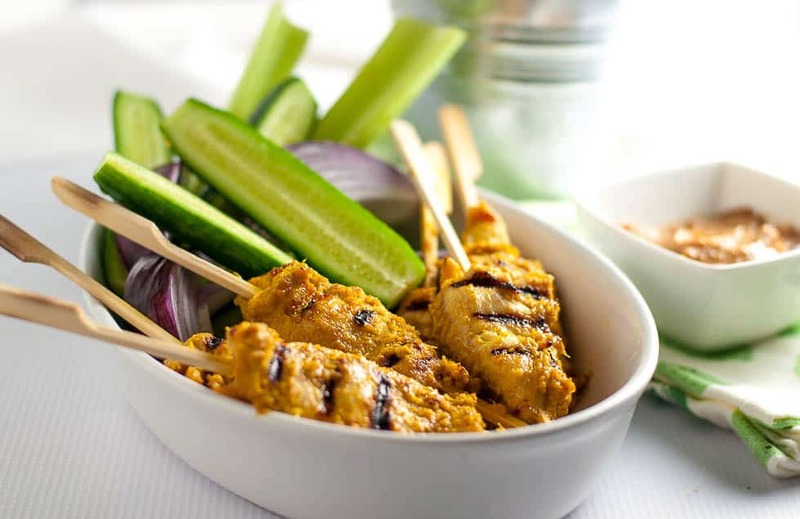 This Chicken Satay makes a great appetizer or a light meal, when served with some crunchy veggies. It's crisp and spicy and it's a perfect choice for a barbecue, a party or a simple weeknight meal. Slice chicken breasts lengthwise into long narrow strips. Combine remaining ingredients in a food processor. Marinate chicken strips in this marinade for 8 hours or overnight. Combine all ingredients for Peanut Sauce in a food processor or blender and process until smooth. Add a little water, if necessary to thin it. Set aside. Soak bamboo skewers in water for 2-3 hours or more. Thread chicken strips on to skewers. Grill over medium-high heat for 2 - 3 minutes on each side. If not cooked through, lower heat and grill 3 minutes longer until fully cooked. 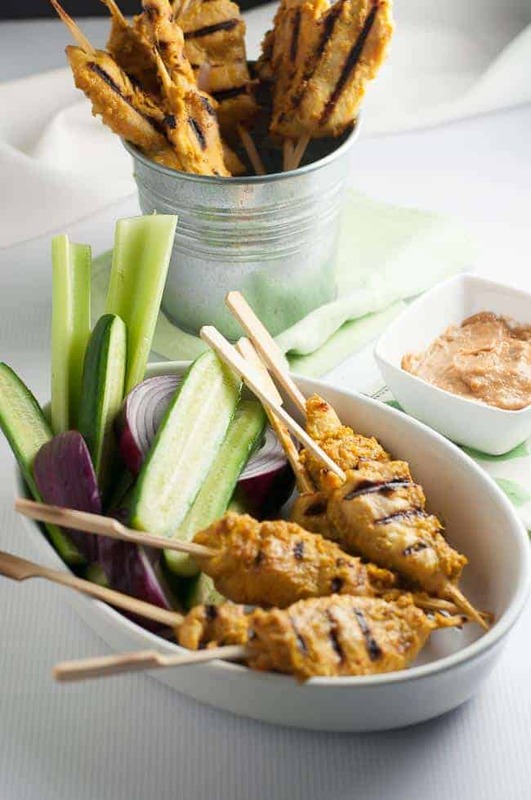 Serve chicken satay hot with sliced cucumbers, red onions, and peanut sauce for dipping. Note: Cooking time listed does not include time to marinate the chicken. Thanks! Food on a stick is always fun to eat, don’t you think? I could eat this every night! It looks delicious! Me too! I’m going to make it with shrimp this weekend. What a great trip that must have been! I love satay, and this looks so good with the peanut sauce! Yes, we had a fabulous time exploring a part of the world that we hadn’t been to before. I love learning about a country through its food! I LOVE satay with peanut sauce and haven’t had it in forever. Thank you for the reminder and the recipe! You’re welcome! Sometimes we just need to explore food blogs to discover our old favourites and make them new again! What a wonderful trip! The outdoor dining street sounds so neat. I love this for a light summer meal. It looks delicious. Thanks Hilary, I hope you get a chance to make them this summer! I love chicken satay with peanut sauce. I have never tried to make it at home – need to give this one a try! I hope you get a chance to make it, Terri. It’s super simple! Ooh I love a good spicy peanut sauce. Your satay skewers look delish! Thanks Shareba! The spicier the better in my opinion! I would love to go to Singapore and it looks like you had a great time. I must make this for my dad. He loves chicken satay and this certainly looks delicious. We loved Singapore, despite the incredible heat!! The satay street food stands were fun, too! 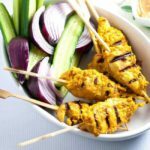 We love Satay and this recipe looks so much easier than the ones I’ve made in the past, but still with all the flavour. Will be trying this one for sure! Oooh, these sound so delicious!! Love the peanut dipping sauce! I can imagine how the lemon grass will add wonderful flavor here.Lovely recipe to try! Thanks! Lemongrass adds such a subtle flavour to recipes. I wish it grew here! Chicken and peanut sauce are the perfect match. This is great as a appetizer. I would use it as a meal with a couple of side dishes. Dinner is served! !